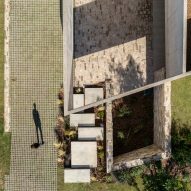 Stone patios and gravel terraces slot in between the monolithic concrete blocks that make up this Argentinian house designed by BP Arquitectura. 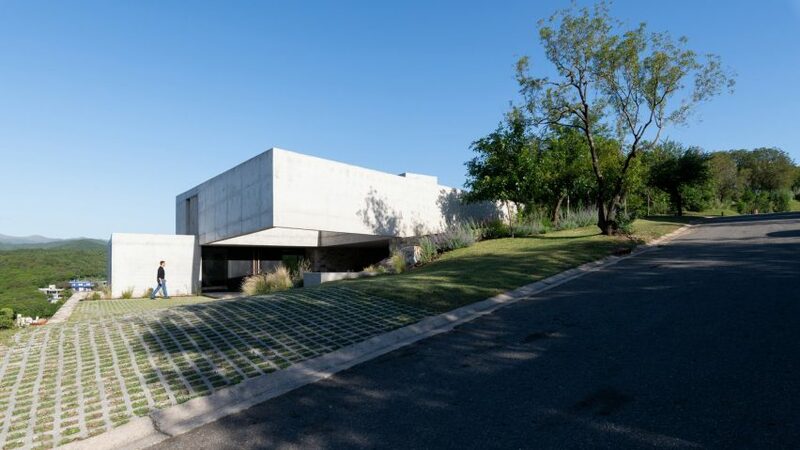 Two concrete volumes are stepped on top of one another to form the 626-square-metre Casa Mq2, which is located on a sloped site in Mendiolaza – a city close to Córdoba. 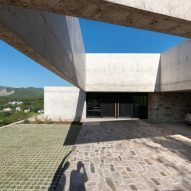 The upper block is staggered back to bridge over a courtyard at the entrance and rests on a hill at the front of the property. 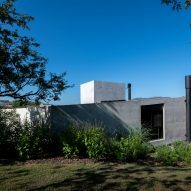 Meanwhile, the lower volume sits atop a stone-walled foundation to link up with the grassy backyard on the other side. 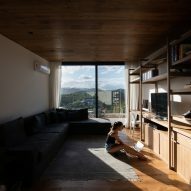 "It presents a rugged topography, with large height differences that allowed us to play with two big volumes supported one over the other one, resting upon the natural terrain," said BP Arquitectura in a project description. 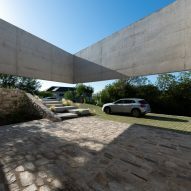 "This situation generates large overhangs, reinforcing the idea of monolithic volumes. 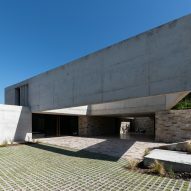 An angular concrete band extends from the street-facing side of the property. 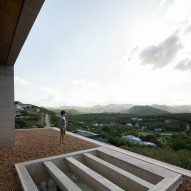 BP Arquitectura designed the screen to shade a gravel patio on the upper level, and outdoor areas on the ground level. 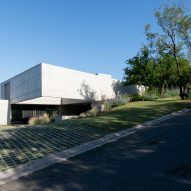 This includes the entrance courtyard, parking for a car and scooter, and a patio with a basketball hoop. 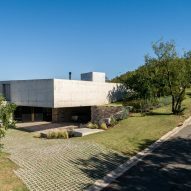 Another terrace wraps around the rear of the property, with views to the surrounding landscape and the swimming pool below. The pool is embedded into a stone-walled structure in the hill below. 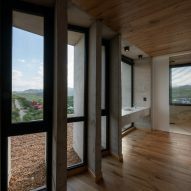 Large expanses of glazing also run along both the upper and lower floors to make the most of the impressive vista. On the ground level, a shaded patio is indented into the bottom level – featuring a fire pit, lounge seating and a dining room – to create a sheltered place for the residents to relax. Concrete louvres cut out of the roof allow light to filter in. 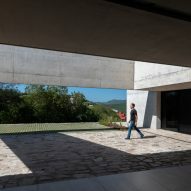 A staircase embedded into the hill leads down to the swimming pool, running alongside an additional, separate block on this floor that contains ancillary spaces, like the laundry room and services. Access to the home's interior is provided by glass doors into the open-plan living, kitchen and dining room. In the main living areas, a simple palette matches the aesthetic of the exterior. White-painted walls are teamed with wooden floors, and an exposed concrete fireplace acts as a focal point. Pale stone flooring is used to separate the kitchen area from the adjoining lounge and dining room. Black units wrap the kitchen, picking up the tones of the window frames and the steps of the staircase. 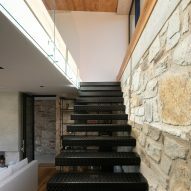 Set into a heavy stone base, the staircase leads up to the top level, where an additional lounge is located. 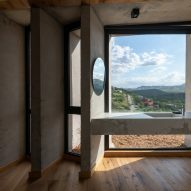 An unusual feature of this space is the matching wooden floors and ceilings. 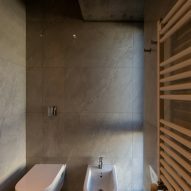 Four bedrooms are also on this level – featuring exposed concrete walls and wooden furnishings – along with the bathrooms. 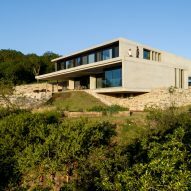 Casa Mq2 is among a number of houses in Argentina that employ exposed concrete to complement rugged landscape backdrops. 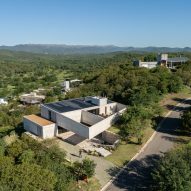 Recently completed examples include Alarciaferrer Arquitectos' Casa MM within a nature preserve and Luciano Kruk's Rodríguez House. Photography is by Gonzalo Viramonte.